There used to be a hole back behind some buildings on Douglas Avenue downtown. That hole has been filled with a brand new “Pop Up Park) – a temporary urban park that will be a nice place for everyone in Wichita to enjoy. The pop-up park is open daily. Most of the food trucks park there between 11 a.m. and 1:30 p.m.on weekdays. To celebrate, and kick off activities in the park, the Wichita Downtown Development Corporation (WDDC) will hold a Grand Opening on Friday, September 25, 2015. In fall 2014, the WDDC received a grant from the Knight Foundation Fund at the Wichita Community Foundation to construct a temporary pop-up park. The park site, formerly known as “The Hole,” will occupy the Douglas Avenue frontage between Market and Main at 121 E. Douglas. The project included filling in “The Hole” with excess fill material (dirt) from the nearby development project on the Arkansas River – River Vista, and the new Child Advocacy Center site. The site will be outfitted with colorful furnishings, planters with trees, a concrete ping pong table, multiple art pieces, and overhead string lights for ambiance at night to create a unique sense of place for the community. The September 25 Grand Opening of the Pop-Up Urban Park will begin with formal remarks and a ribbon cutting at 11:30 am, followed by live music and the kickoff of lunch service in the park from local food trucks The Flying Stove, Funky Monkey Munchies, Let’m Eat Brats, and B.S. Sandwich Press. Later that evening, the Pop-Up Urban Park will be a Final Friday art crawl location to celebrate the artistic components of the park and the contributing artists. Together Wichita, an initiative of local businesses and the Wichita Eagle, donated three “Keepers on Parade” statues, which have each been distinctly painted by local artists Doug Billings, Sean Ward, and Matthew Hilyard. Kansas State University landscape architecture students designed and produced several custom furnishings for the park, and Nick Mercado, a recent K-State graduate, created a 16’ x 8’ art installation titled “Sunflower,” that will also be hung in the park. During Final Friday, food trucks will be on site serving food, with live music throughout the evening. Following the Grand Opening event, food trucks will be at the park daily Monday – Friday serving lunch. 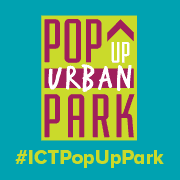 Keep up-to-date with additional community events and activities in the park in the coming months, and find additional event information on the Pop-Up Urban Park’s Facebook page at https://www.facebook.com/ICTPopUpPark.